Fearless hero Captain Kronos has dedicated his life to the destruction of vampires after his mother and father were afflicted by the curse and he was forced to destroy them both. Together with his faithful hunchback assistant Grost, he rides into the village of Durward. His arrival is timely, for beautiful young girls have been dying there recently – dying of old age, their youth and beauty sucked from their bodies! 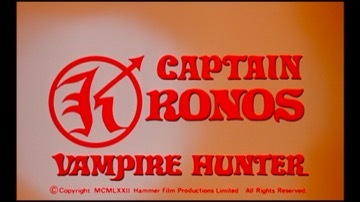 Kronos’s search leads him to the Durward family itself, which holds a terrible secret…..
As well as financing problems, Hammer now began to have distribution difficulties and this film was scarcely shown in cinemas at all, eventually escaping to very limited showings in 1974; which is a shame, because it is one of the best and most original of their later films, with fine production values and a witty sense of humour. Its lack of distribution soon quashed hopes that “Kronos” would develop into a television series. Horst Janson’s voice was dubbed by actor Julian Holloway, one of the regulars of the “Carry On” supporting cast. To compose the music, Albert Fennell and Brian Clemens brought in Laurie Johnson, who had written the memorable theme for ABC TV’s “The Avengers”, which they had produced. Also from “The Avengers”, the role of Kerro was given to Ian Hendry, who had been one of the original stars of the series. He was by this time already suffering from the alcohol-related problems which would later kill him.